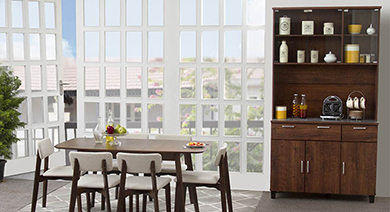 Carve inspiring décor into your kitchen with stylish dining storage. From display cabinet to sideboards, bar stool and kitchen racks, add sophistication to your home with chic decor. Space out tablecloths, napkins, and candle stands or flaunt your china in exquisite display cabinets from Urban Ladder. From hallways, living rooms, dining area to kitchens, these display cabinets oozes style wherever they stand. Feast your eyes on some of the hottest display cabinets in rich teak, sheesham wood or solid mahogany finishes. Whether single or two-doors, these multi-purpose cabinets make a perfect team up with your fabulous dining room furniture. Designed with glass and wooden doors, these cabinets allow your guests to savour your cherished mementos, photographs and books in awe. With tall, open shelves, space is not a problem at all. Concealed cabinets are best used to stow away towels, files and documents, stationery or toiletries for quick access later. Organize your wines and cocktails elegantly in bar cabinets and units. Tradition meets modern tastes in solid weathered wood that allows generous storage. 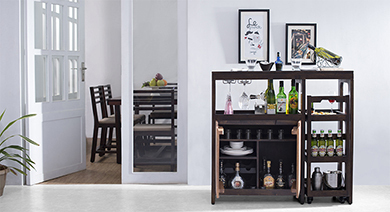 With built-in racks for full size bottles, long stemmed glasses and open wine racks, bar cabinets sits modestly with your urbane decor appeal. Open shelves stocks up petite glasses or bottles while its intrinsic drawer houses bar accessories. Appeal to your flamboyant sense of style with revolving round bar units with sliding shelves and extra counter space for serving. Optimize your dining capacity with trendy bar stools. Spice up your surroundings with colourful, funky bar stools for an informal gathering. Whether at a kitchen island, counter or around the fireplace, its solid wooden frame or delicate wired structure adds ingenuity and elegance to your homes. Tidy up your essentials with groovy sideboards with ample drawers and shelves. Stack up personal clothing, cosmetics or even as shoe racks. Built using the most versatile materials like teak, mahogany, and wood, these contemporary masterpieces of minimalist design are perfect for your home. the premium build material ensures durability and longer life with no pest infestations. Buy display cabinets at amazing prices only on Urban Ladder.